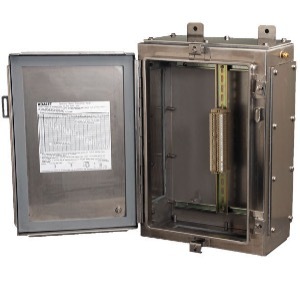 Adalet's TN4X(6) series terminal enclosures are available in stainless steel 304 or 316L. Adalet can also supply custom size enclosures, operators, and components to suit your increased safety application. Silicone gaskets, removable hinge pin, box and cover ground studs including an external earthing stud and universal rail mounting system are included as standard.